Where to buy that special holiday souvenir or present? For something extra special and unique to Galway visit the Claddagh Ring shop, they even have a small free museum which tells you all about its history as an Irish wedding ring since the 13th century. Other traditional Irish crafts including woven tweeds and hand knitted Aran jumpers can be found in O’Mailles which famously dressed the cast of the Quiet Man. While the Treasure Chest stocks well known brands like Royal Tara and Belleek pottery as well as Waterford Glass and Galway Crystal. Which might all be a little old fashioned for you or not depending on your taste? Ireland has some of the finest contemporary designers in the world offering first class crafts in practically every medium. One of the first was Judy Greene, a Galway potter whose signature pieces were handpainted with fuchsias, which grown wild along the hedgerows in the West of Ireland. She is now patron to and champion of the very best Irish Designers. 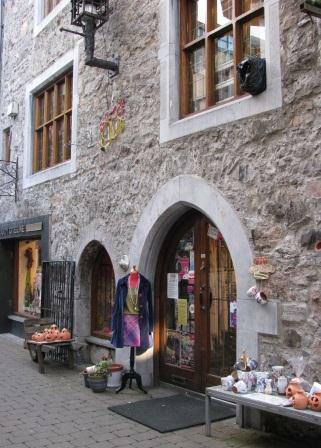 Her emporium, in a wonderful old medieval building on Kirwans Lane is a pleasure to browse around. And while you are there step into Yes Flowers on the corner, whose imaginative and innovative window displays, not to mention hand tied bunches of fresh flowers. are an absolute delight all year round. Kilkenny Design on High Street is a very nice shop, check out the giant medieval fireplace on the ground floor, that stocks plenty of good Irish designers including my favourite Irish jeweller, Alan Ardiff and Nicholas Mosses spongeware pottery. The Blarney Woollen Mills on Merchants Road has nice hand knitted hats and scarves while upstairs in the same building, Meadows & Byrne, a browsers paradise, have nice gifts and home wares that are a little bit different. 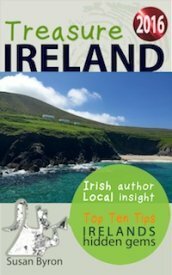 Irelands Hidden Gems - Galway City Guide is now available as an iPhone app It features the 10 Best of Everything there is To See and Do in Galway, plus an extra What's On in Galway? page which is updated monthly and a handy map showing all the major landmarks etc. 1	Barna Gifts Mainguard St, very homely, good selection, family owned and run for 25 years. 2	Blarney Woollen Mills Merchants Rd, contemporary Irish clothing designs and knitwear from Donegal and the Aran Islands with Meadows & Byrne upstairs. 3	Claddagh Ring Shop High St, the oldest shop in Galway, all the rings are hand crafted on the premises. 4 Fallers Jewellers Williamsgate St, also in business since 1879, they also do a range of celtic styled jewellery including bespoke engagement rings. 5 Judy Greens Kirwans Lane, very old medieval building, check out the original gas lanterns outside. Inside there are handcrafted pieces by Irish designers. 6	Kilkenny Design High St, good selection of jewellery & pottery downstairs with clothing and accessories upstairs. 8	Powells Music Shop Shop St, Irish music and instruments, with arts suppliers upstairs, very friendly staff. 9 Treasure Chest Shop St, has everything from Foxford woollen blankets to Aran knitwear, Belleek and Royal Tara china ornaments. 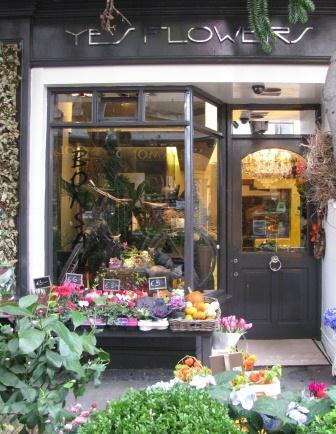 10 Yes Flowers Cross St, lickable windows, designer floral arrangements, absolutely beautiful flowers always, hint, hint!